US President Donald Trump has congratulated President Fattah al-Sisi for his landslide victory in the presidential elections, which recorded a poor turnout as main opposition figures withdrew from the process they deemed unfair. The two leaders and allies according to the White House held a telephone conversation a day after the incumbent Egyptian President was announced winner with 97 per cent of the votes with a turnout put at 40 per cent. 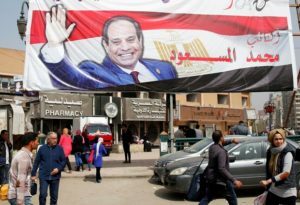 Al-Sisi contested for a second term in office against his ally turned-candidate for the circumstance, Moussa Mostafa Moussa. Trump’s office said that both leaders affirmed he strategic partnership between the United States and Egypt, and noted that they look forward to advancing this partnership and addressing common challenges. The Trump administration has emerged as one of al-Sisi’s foreign major supports despite democratic and human right deficit. Trump views the Egyptian leader as a close ally in the fight against terrorism. Observers criticized the electoral process even before its kickoff after potential opponents to the general-turned president cancelled their bids over threats or found themselves arrested before candidacy registration. The autocratic leader in 2013 removed the country’s first democratically elected President Mohamed Morsi before winning subsequent elections the following year by a large margin; 96.9 of valid votes. Posted by KanelkaTagba on Apr 4 2018. Filed under Headlines, World News. You can follow any responses to this entry through the RSS 2.0. Both comments and pings are currently closed.